Custom Je reste europeenne. 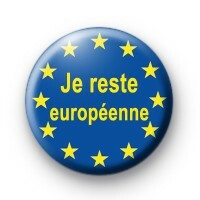 European referendum badge. These badges are still super popular with all of us opposed to the Uk leaving the EU and are perfect for anti-Brexit marches. EU button badge handmade in our UK workshop and perfect to wear to the airport for your European trips & summer holidays. We have a large range of pro-EU badges available so have a search or check out the political badge category on the left-hand side. 25mm badge made in our UK workshop & available for worldwide delivery.